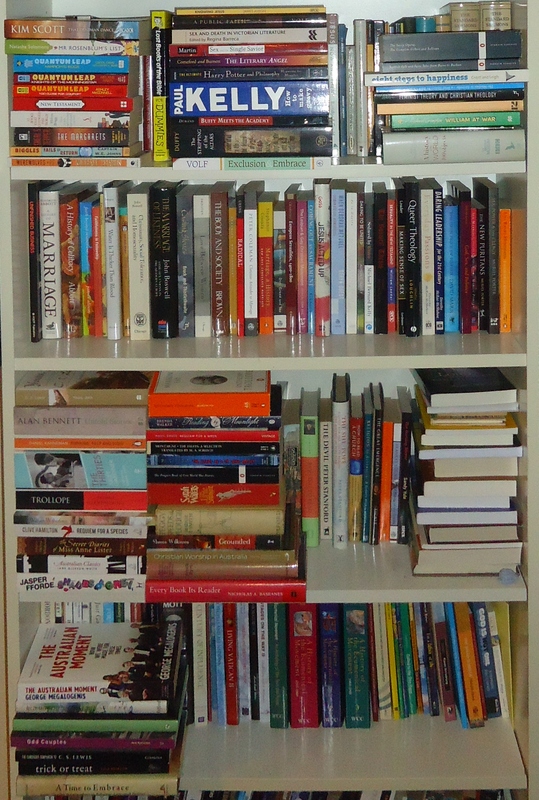 I have twelve bookcases in my two-bedroom flat. I live surrounded by several thousand books – and as long I don’t leave a lighted candle too close to any of them this isn’t a problem. But I also live surrounded by piles of books that haven’t made it into bookcases – because I’ve bought them or been given them, and haven’t yet read them. And that’s more of a problem. Wonderful, fabulous books, that I want to read, but never get round to, because I am constantly adding to their number. There are over 100 of them at most recent count. So, I have chosen 91 of these books (I think it’s 91 – my counting may be off) and I have made a commitment that I will not buy another book until these 91 have been read. * And you’re all going to help me. Here is the list. As I read each book I will cross it off on this list. I’ll review them on Goodreads. I will then take the poor wee books out of the random piles in which they currently live and give them a place on one of my bookcases (alphabetical within subject – don’t judge me!). And you’ll keep me honest, won’t you, internet people? Please! 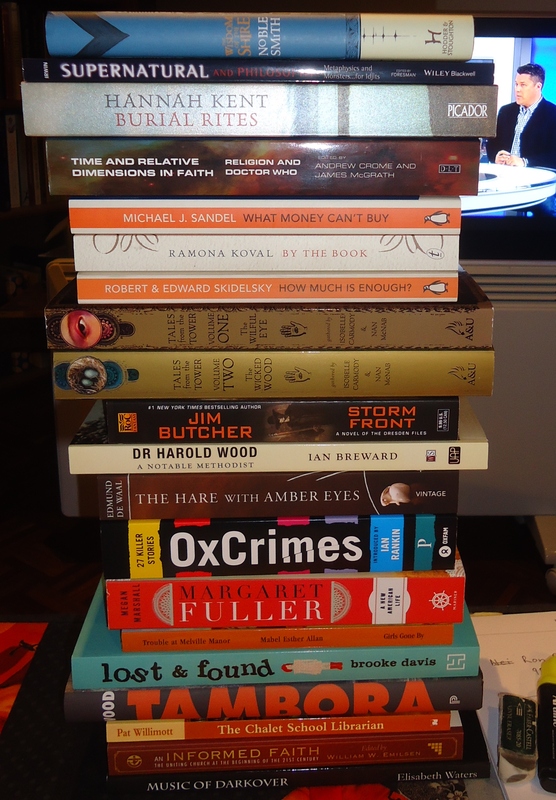 My name is Avril and I’m not merely a bookaholic, I’m a purchaser-of-books-aholic. Help me overcome this addiction. Anthony Trollope: Is He Popenjoy? Michael Kirby: What would Ghandi do? *This commitment will be in abeyance when I am overseas – I’ve already made a list of second-hand bookshops that I’m planning to visit in the UK, and I refuse to deny myself the option of buying books in airports in the midst of 24 hours of flying. This entry was posted in Addictions, Books, Random Musings. Bookmark the permalink. Can we make suggestions for what to read next? Because I think I recommended Gilead the last time you posted a list like this somewhere. Also, Take this bread would be near the top of my list. You can suggest as long as they are on this list. No suggestions of books not on the list! I am not sure how we are to help you here. I have read almost nothing on your list, except Shades of Grey (which I think Damian gave us) and Thinking Fast and Slow (which was super interesting). And possibly Storm Front (if so, it was crap). And Reading by Moonlight, which was good but forgettable. I save Trollopes for international flights. I have some book suggestions for you, but to make them will be counterproductive. I’ll hold onto them until you get through your list. The Trollopes may be coming with me to a conference, because they’re tiny and take up little room in luggage, but are also nice meaty romances. Yes, don’t suggest any books that aren’t on this list! That wouldn’t help at all!!! Also, Thinking fast and slow had 0 penguins in it. They are probably fast thinkers in the water, but slow thinkers in the huddle.